[exposures,exposurecpty] = creditexposures(values,counterparties) computes the counterparty credit exposures from an array of mark-to-market OTC contract values. These exposures are used when calculating the CVA (credit value adjustment) for a portfolio. [exposures,exposurecpty] = creditexposures(___,Name,Value) adds optional name-value arguments. [exposures,exposurecpty,collateral] = creditexposures(___,Name,Value) computes the counterparty credit exposures from an array of mark-to-market OTC contract values using optional name-value pair arguments for CollateralTable and Dates, the collateral output is returned for the simulated collateral amounts available to counterparties at each simulation date and over each scenario. 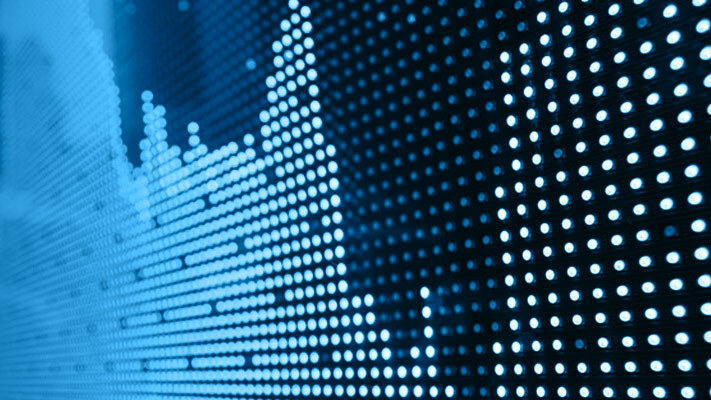 After computing the mark-to-market contract values for a portfolio of swaps over many scenarios, compute the credit exposure for a particular counterparty. View the contract values and credit exposure over time. 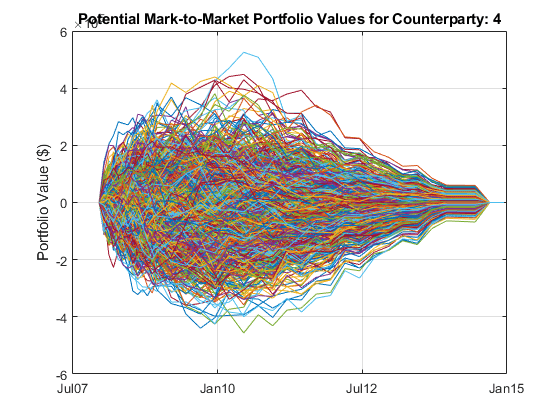 First, load data (ccr.mat) containing the mark-to-market contract values for a portfolio of swaps over many scenarios. % Look at one counterparty. % Compute the exposure by counterparty. % View the credit exposure over time for the counterparty. Load the data (ccr.mat) containing the mark-to-market contract values for a portfolio of swaps over many scenarios. View the credit exposure over time for the counterparty. Compute the credit exposure profiles. Consider a new trade with a counterparty. For this example, take another trade from the original swap portfolio and "copy" it for a new counterparty. This example is only for illustrative purposes. % Append a new trade to your existing portfolio. Compute the new credit exposure profiles. 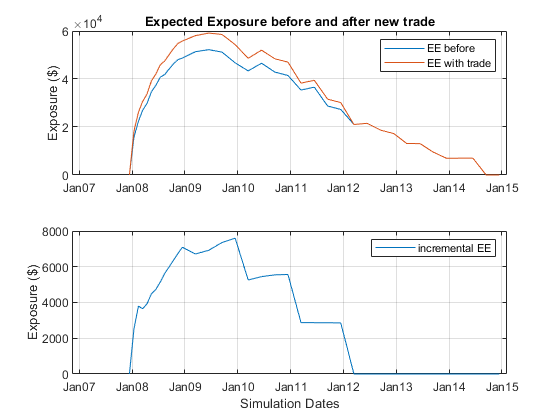 Visualize the expected exposures and the new trade's incremental exposure. The incremental exposure is used to compute the incremental credit value adjustment (CVA) charge. Only look at a single counterparty for this example. Now add a collateral agreement for the counterparty. The 'CollateralTable' parameter is a MATLAB® table. You can create tables from spreadsheets or other data sources, in addition to building them inline as seen here. For more information, see table. Plot the collateral levels and collateralized exposures. 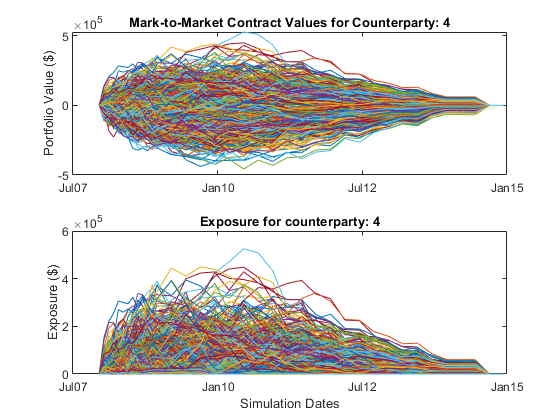 3-D array of simulated mark-to-market values of a portfolio of contracts simulated over a series of simulation dates and across many scenarios, specified as a NumDates-by-NumContracts-by-NumScenarios “cube” of contract values. Each row represents a different simulation date, each column a different contract, and each “page” is a different scenario from a Monte-Carlo simulation. Counterparties corresponding to each contract in values, specified as a NumContracts-element vector of counterparties. Counterparties can be a vector of numeric IDs or a cell array of counterparty names. By default, each counterparty is assumed to have one netting set that covers all of its contracts. If counterparties are covered by multiple netting sets, then use the NettingID parameter. A value of NaN (or '' in a cell array) indicates that a contract is not included in any netting set unless otherwise specified by NettingID. counterparties is case insensitive and leading or trailing white spaces are removed. Netting set IDs to indicate to which netting set each contract in values belongs, specified by a NumContracts-element vector of netting set IDs. NettingID can be a vector of numeric IDs or else a cell array of character vector identifiers. The creditexposures function uses counterparties and NettingID to define each unique netting set (all contracts in a netting set must be with the same counterparty). By default, each counterparty has a single netting set which covers all of their contracts. A value of NaN (or '' in a cell array) indicates that a contract is not included in any netting set. NettingID is case insensitive and leading or trailing white spaces are removed. 'Counterparty' — Compute exposures per counterparty. 'Additive' — Compute additive exposures at the contract level. Exposures are computed per contract and sum to the total counterparty exposure. 'Counterparty' — Counterparty name or ID. The Counterparty name or ID should match the parameter 'Counterparty' for the ExposureType argument. 'PeriodOfRisk' — Margin period of risk in days. The number of days from a margin call until the posted collateral is available from the counterparty. 'Threshold' — Collateral threshold. When counterparty exposures exceed this amount, the counterparty must post collateral. 'MinimumTransfer' — Minimum transfer amount. The minimum amount over/under the threshold required to trigger transfer of collateral. When computing collateralized exposures, both the CollateralTable parameter and the Dates parameter must be specified. Simulation dates corresponding to each row of the values array, specified as a NUMDATES-by-1 vector of simulation dates. Dates is either a vector of MATLAB date numbers or else a cell array of character vectors in a known date format. See datenum for known date formats. When ExposureType is 'Counterparty', exposures returns a NumDates-by-NumCounterparties-by-NumScenarios “cube” of credit exposures representing potential losses that could be incurred over all dates, counterparties, and scenarios, if a counterparty defaulted (ignoring any post-default recovery). When ExposureType is 'Additive', exposures returns a NumDates-by-NumContracts-by-NumScenarios “cube,” where each element is the additive exposure of each contract (over all dates and scenarios). Additive exposures sum to the counterparty-level exposure. Counterparties that correspond to columns of the exposures array, returned as NumCounterparties or NumContracts elements depending on the ExposureType. 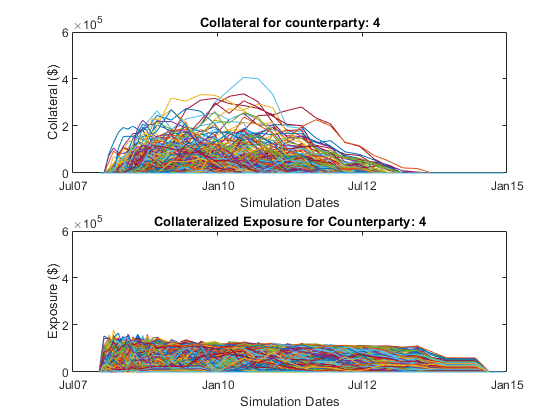 Simulated collateral amounts available to counterparties at each simulation date and over each scenario, returned as a NumDates-by-NumCounterparties-by-NumScenarios 3D array. Collateral amounts are calculated using a Brownian bridge to estimate contract values between simulation dates. For more information, see Brownian Bridge. If the CollateralTable was not specified, this output is empty. A Brownian bridge is used to simulate portfolio values at intermediate dates to compute collateral available at the subsequent simulation dates. For example, to estimate collateral available at a particular simulation date, ti, you need to know the state of the portfolio at time ti – dt, where dt is the margin period of risk. Portfolio values are simulated at these intermediate dates by drawing from a distribution defined by the Brownian bridge between ti and the previous simulation date, ti–1. and with mean that is simply the linear interpolation of the contract values between the two simulation dates at time tc. For more details, see References. Lomibao, D., and S. Zhu. “A Conditional Valuation Approach for Path-Dependent Instruments.” August 2005. 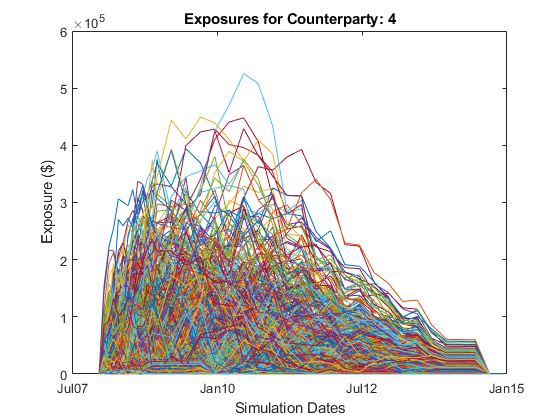 Pykhtin M. “Modeling credit exposure for collateralized counterparties.” December 2009. Pykhtin M., and S. Zhu. “A Guide to Modeling Counterparty Credit Risk.” GARP, July/August 2007, issue 37. Pykhtin, Michael., and Dan Rosen. “Pricing Counterparty Risk at the Trade Level and CVA Allocations.” FEDS Working Paper No. 10., February 1, 2010.